What is more likely: someone from the lower class moving to middle class, or someone from middle class moving to the lower class? 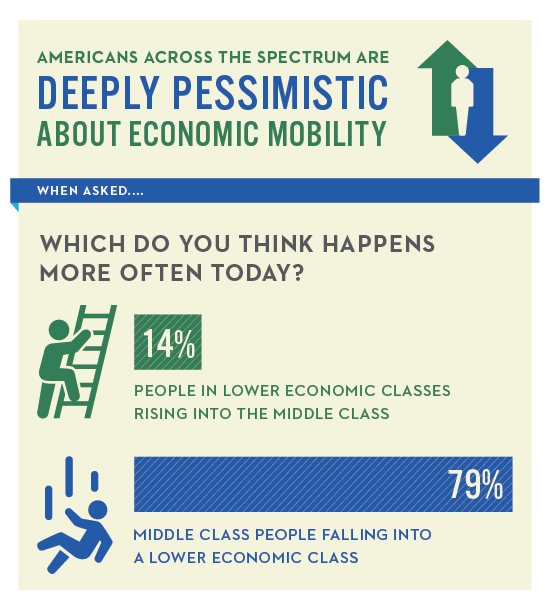 At least in America, only 14% believe a rise is more likely, but 79% a drop is more likely. Those attitudes are tied to the perceived, or experienced, lack of a housing recovery. Nearly stagnant wage growth, persistent debt, and a lack of mobility are leaving many feeling trapped. Unfortunately, they don’t think the government understands this. The result is that many Americans are trying to satisfy themselves with a simple dream of financial stability because they see little reason to expect to get ahead, and ample reason to believe they have to fend for themselves and create their own safety net.